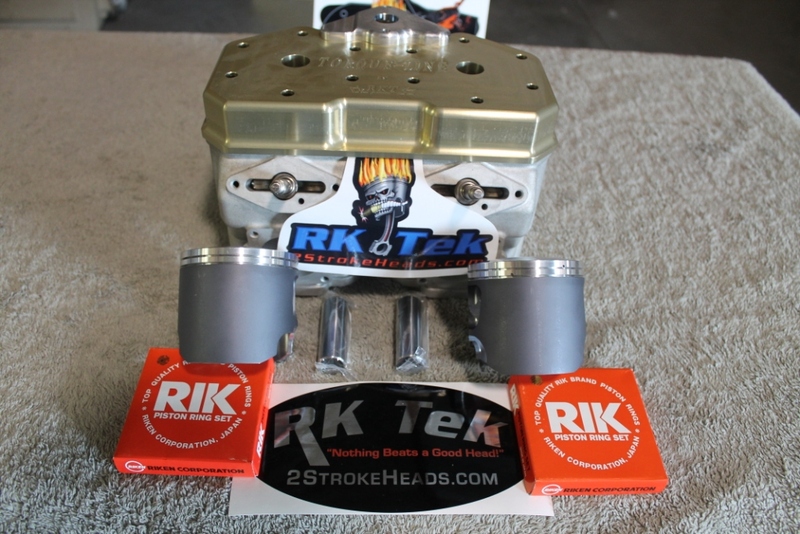 RK Tek Has developed an 827 (REALLY an 830cc) kit for the 2001-2007 800 Twin Engine. While we were not planning on big performance improvements in this little over-bore... we were soon proved WRONG! In side by side (stock 800 pipe) bench-mark testing against our RKT Mod 800 Engine Kit .. the 827 would pull 5 lengths on the hills and flats over our modified 800. This came as a HUGE surprise to us but the results do not lie. We were very pleased to say the least!! PLEASE NOTE: You will need to CALL for this kit and you must send in your cylinders and valves in order for this kit to be completed. This kit, on a 2001 MXZ 800 was dyno'd in 2005 at Dyno Tech Research in New York and showed 166.8HP with the STOCK Pipe and can. That is over a 40HP gain from the 2001 engine's power (124-130HP) For more on this kit and that dyno session please visit www. dynotechresearch.com and read a bit more . Now this kit has been in existence for over 10 years and has certainly withstood the test of time!! There are 100's of them out there running and running very well. After 10 years, there are really no more variables or "surprises" the kit REALLY is that SOLID!! This 827 kit is unlike all other big-bore kits. It uses your stock cylinders and does not require sleeving the cylinders. When you sleeve the stock cylinders.. transfer tunnel area is GREATLY diminished. This is not a good thing! One of the short-comings of the Series III engines is the transfer tunnel area... IT IS NOT LARGE ENOUGH! Proper porting can partially resolve this short-coming BUT once you sleeve the cylinder.. the tunnel area is greatly diminished and can NOT be restored. Aftermarket cylinders can address this issue but are quite expensive! Options-- Great addition but NOT required! The engine's port timing is drastically altered due to the piston's unique geometry. So, even if you choose the non-ported 827 kit, the porting is drastically altered.